Verdure Fontainbleu tapestry shows a gorgeous verdure scene based on originals from French 17th century tapestries. Here we see a secluded scene of a river with logs, forest greenery and forest verdure. The detail is exquisite as is the color profile with gradations of tones of golden browns, blue greens, greens and beige tones. Fontainbleu is a town of royalty in a commune in France which has been a place of royalty from the 12th century, and includes the Fontainbleu forest. The light of the forest is suggested beautifully by the use of color and tones. The play of pattern in the leaves is typical of the French verdure and landscape tapestries of forests and adds vibrancy and sense of life to the tapestry. The elaborate border completes this beautiful work. 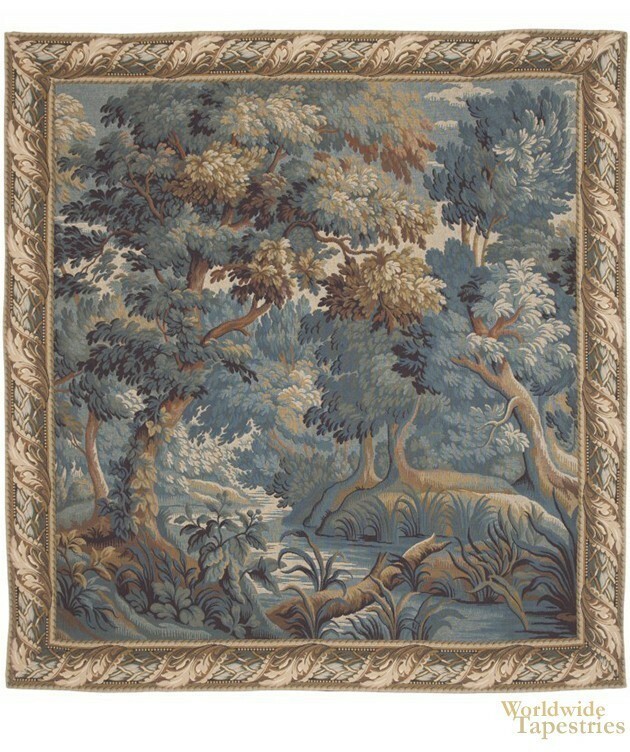 This tapestry Verdure Fontainbleu is backed with a lining and a tunnel for easy hanging. Note: tapestry rods and tassels, where pictured, are not included in the price. Dimensions: W 67" x H 71"